Music, theatre and other arts are being used as a vibrant way of communicating anti-human trafficking messages to hilltribe children. “The audience can easily understand our messages,” A-mee Biapa said. This Lisu girl is a key member of We-Love-Hilltribe-Art Youth Group, which is associated with the Hill Area and Community Development Foundation of Chiang Rai, Thailand. A student at the Rajabhat Chiang Rai University, A-mee is confident she can inspire younger hilltribe girls to follow her path and guard against becoming victims of human trafficking. “We have the same background. We can communicate well,” A-mee said. “I wear hilltribe clothes when meeting the children”. A-mee said her group campaigns against human trafficking and domestic violence. “When the children confide in us, we alert community leaders,” A-mee said. 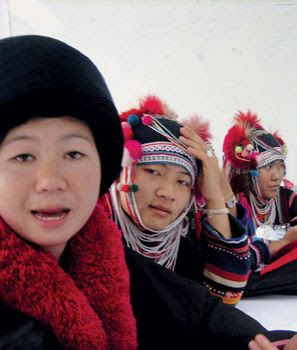 Her group includes young people of the Akha, Yao, Lisu and Lahu hilltribes. They recently staged a performance at a mobile seminar in Chiang Rai. The social development and human security ministry event is designed to illustrate how everyone can prevent human trafficking. “We use art to communicate our message. Just delivering a speech can bore people,” said Chatchai Wittayabamrung, an adviser to the art group. One of his songs, Pla aam pla khao, talks about how a hilltribe girl is lured into the flesh trade by the man she loves. After a life of misery, she returns to find her family and community still welcome her.